Long Cover Time up to 10 hours :300ml capacity for continuous use in weak mist mode (6 hours in strong mist mode); 1h, 3h, 6h timer and continuous mist mode to choose from. Use it day or night. 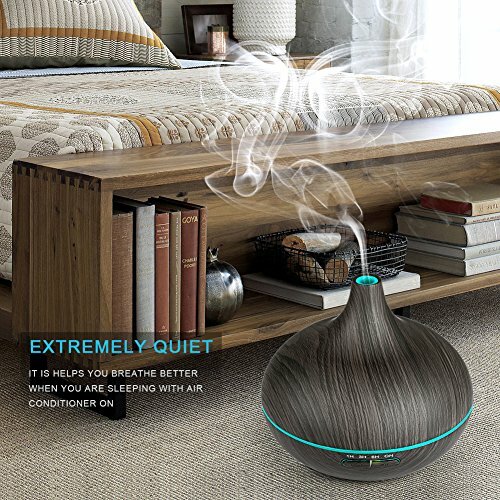 Ultrasonic Quiet: Adopted advanced ultrasonic technology, this humidifier is extremely quiet when working. It gives out ultra-fine and smooth mist which can soften and moisten dry and chapped skin in winter. It also helps you breathe better when you are sleeping with air conditioner on. 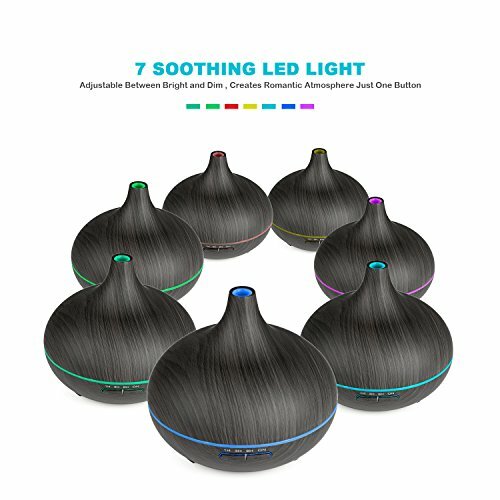 7 Soothing LED Night lights: You can choose among 7 colors between two mode: steady on/changing color. Each color is adjustable between bright and dim. The soft light creates romantic atmosphere which helps you escape the hustle and bustle of modern life. Excellent Atomization Technology for Better Performance: Essential oil fragrance spreads quickly, Which infuses lovely fragrance and bring tranquilizing atmosphere to your room, perfect for relieving fatigue and stress, creating a comfortable and relaxed environment. 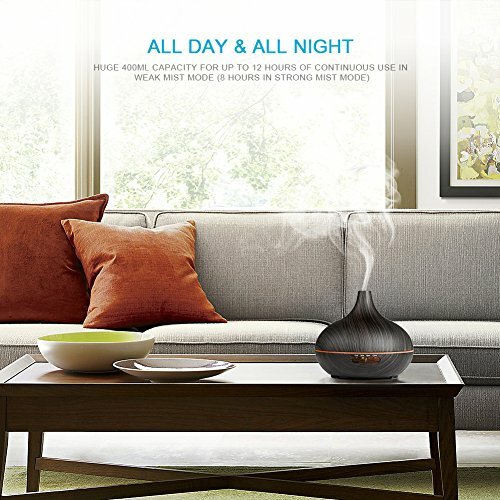 The aromatherapy diffuser has virtually every possible option and makes a lovely addition to any space. 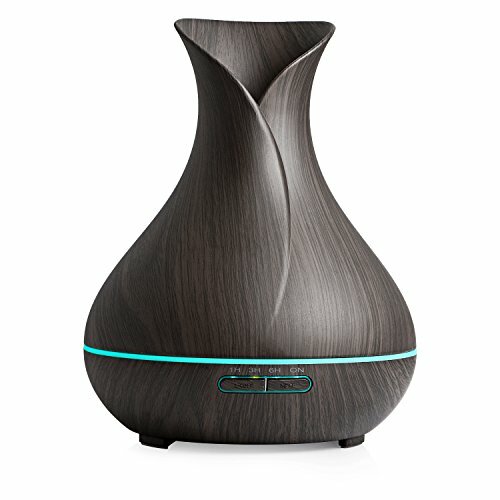 This diffuser humidifier releases a massive stream of vapor out of its petals. 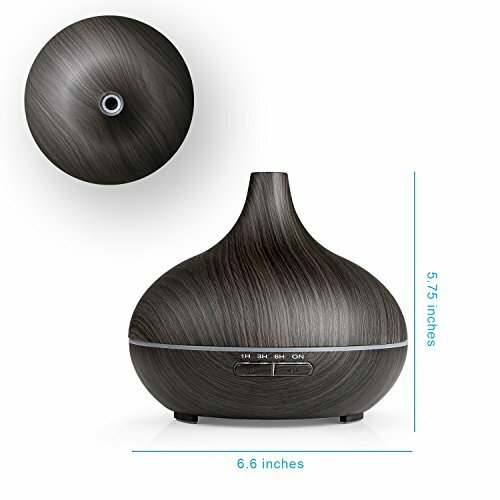 This fragrance diffuser and super quiet humidifier model uses the latest in ultrasonic technology to bring you maximum empowerment of soul and body, releasing the tiniest of micron-sized droplets that suspend in the air longer, yielding maximum inhalation benefits. The diffuser has a light display or constant, glowing night light option in 7 different colors, and with its whisper-quiet technology, it’s perfect for use while sleeping or in children’s rooms. 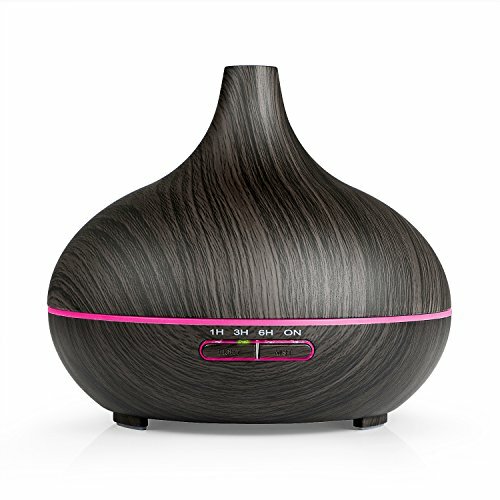 This diffuser boasts a huge 300 ml capacity and long diffusion settings (6-10 hrs.) which means little water or oil replacement. The auto shut off and optimal diffusion settings seal the deal, giving this diffuser every amenity possible. 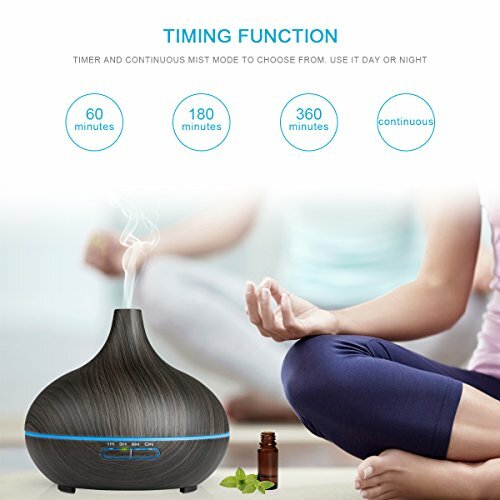 Applied with ultrasonic technology, safe and no noise (Ultra Quiet 20-40dB), REIDEA Aromatherapy diffuser humidifier do not disturb your rest and sleep. Make you stay away discomfort from the dry and cold winter, Ensuring you a good sleep at the same time. You can choose among 7 colors between two mode: fixed color / Breathing. Each color is adjustable between bright and dim. The soft light creates romantic and peaceful atmosphere which helps you get away from the hustle and bustle of modern life.Totally relexed and emerged yourself in a happy and quiet mood. -Convenient 1,3 and 6 hour timer or all-night continuous mode. 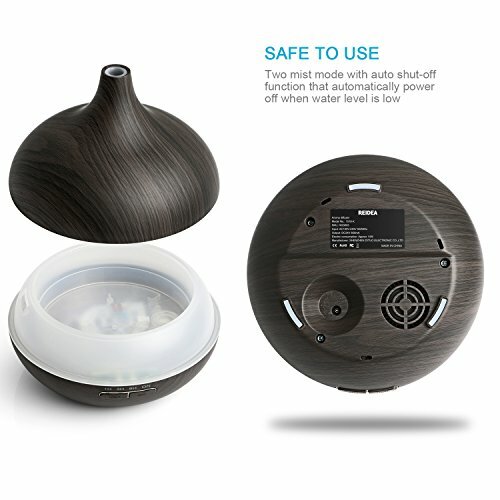 -Ultrasonic humidifier diffuser technology with automatic shut-off function.